Email specifically for Nitrozac and Snaggy can go here. For information about our advertising rates, click here! Check out our many Awards and Honors! We always appreciate your input! Send us a photo of your geek-o-sphere and we might post it on our geek-o-sphere page. Would you like to announce your feelings for your computer with a poem? Send it to us and perhaps we'll post it on our Computer Love page. Perhaps you have feelings other than love for your computer? Tell us your computer horror stories and perhaps it will be posted on our Computer Horror Stories page.... scary! Had a Mind-Numbing Job lately? We'll try to put it on our Mind Numbing Jobs page. 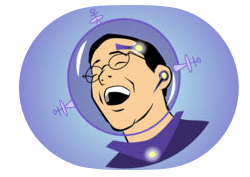 upLinks is always looking for the best geeky sites. If you think a site is Cache Worthy, let us know and we'll add it to upLinks pronto! Geek Culture® uses all reasonable precautions to keep any personal information disclosed to us secure. We recognizes that many Internet users wish their email addresses and other personal information remain private. As such we will not sell or give access to any of this kind of information that may be acquired during the normal operations of this website. Geek Culture maintains a separate mailing list for those wishing to keep informed of updates to the site, or special promotions, and the addresses and information in that list are also kept confidential. 3. Limited Warranty on Media (if applicable). Geek Culture warrants the media on which the software is recorded to be free from defects in materials and workmanship under normal use for a period of ninety (90) days from the date of original retail purchase. Your exclusive remedy under this paragraph shall be, at GeekCultures option, a refund of the purchase price of the product containing the software or replacement of the software which is returned to GeekCulture with a copy of the receipt. THIS LIMITED WARRANTY AND ANY IMPLIED WARRANTIES ON THE MEDIA INCLUDING THE IMPLIED WARRANTIES OF MERCHANTABILITY AND FITNESS FOR A PARTICULAR PURPOSE ARE LIMITED IN DURATION TO NINETY (90) DAYS FROM THE DATE OF ORIGINAL RETAIL PURCHASE. SOME JURISDICTIONS DO NOT ALLOW LIMITATIONS ON THE TERM OF AN IMPLIED WARRANTY, IF THIS AGREEMENT IS SUBJECT TO THE LAWS OF SUCH JURISDICTION THIS LIMITATION MAY NOT APPLY. THE LIMITED WARRANTY SET FORTH HEREIN IS EXCLUSIVE AND IN LIEU OF ALL OTHER WARRANTEES AND GUARANTEES, WHETHER ORAL OR WRITTEN, EXPRESS OR IMPLIED. GEEK CULTURE SPECIFICALLY DISCLAIMS ALL OTHER WARRANTIES. THIS LIMITED WARRANTY GIVES YOU SPECIFIC LEGAL RIGHTS, AND YOU MAY ALSO HAVE OTHER RIGHTS WHICH VARY BY JURISDICTION. and supported by our advertisers, wonderful customers, and great surfers. Additional contributions by HitMan200, Meryn Cadell, Geek Jane, and many other fine web surfing geeks!